The Prince of Wales's feathers is the heraldic badge of the Prince of Wales. It consists of three white ostrich feathers emerging from a gold coronet. A ribbon below the coronet bears the motto Ich dien (German: [ɪç ˈdiːn], "I serve"). As well as being used in royal heraldry, the badge is sometimes used to symbolise Wales, particularly in Welsh rugby union and Welsh regiments of the British Army. The Black Prince's "shield for peace". The badge has no connection with the native Princes of Wales. Its use is generally traced back to Edward, the Black Prince (1330–1376), eldest son and heir apparent of Edward III of England. Edward bore (as an alternative to his differenced royal arms) a shield of Sable, three ostrich feathers argent, described as his "shield for peace", probably meaning the shield he used for jousting. These arms can be seen several times on his chest tomb in Canterbury Cathedral, alternating with his royal arms (the royal arms of King Edward III differenced by a label of three points argent). The prince also used badges of one or more ostrich feathers in a number of other contexts. The feathers had first appeared at the marriage of Edward III to Philippa of Hainault, and it is therefore likely that the Black Prince inherited the badge from his mother. Philippa was descended from the Counts of Hainault, whose eldest son bore the title "Count of Ostrevent", the ostrich (French: autruche, Old French spellings including ostruce) feathers being (perhaps) a heraldic pun on that name. Alternatively, the badge may have derived from the Counts of Luxembourg, from whom Philippa was also descended, and who had used the badge of an ostrich. Edward III occasionally used ostrich feather badges, as did other members of the royal family in the 14th and 15th centuries. The Black Prince's younger brother, John of Gaunt, used ostrich feathers in several contexts, including on a shield very similar to Edward's "shield for peace", although in this case the feathers were ermine. Edward's illegitimate son, Sir Roger de Clarendon, bore arms of Or, on a black bend, three ostrich feathers argent; and his legitimate son, King Richard II, used ostrich feather badges in several colours. Henry IV used a badge of a single ostrich feather with a scroll entwined around it bearing the motto "Ma sovereyne" or "Sovereygne"; and, of Henry's sons, Henry V used ostrich feathers as a secondary royal badge at various times, Thomas, Duke of Clarence used an ermine ostrich feather labelled; John, Duke of Bedford an ostrich feather with the "Sovereygne" scroll; and Humphrey, Duke of Gloucester an ostrich feather studded with fleurs-de-lis. Similar badges were used by other royal princes. The first Prince of Wales to use the badge in its modern form (i.e. three white feathers encircled by a coronet, and with the motto Ich dien) was Prince Arthur (1486–1502), eldest son of Henry VII, at the beginning of the 16th century. 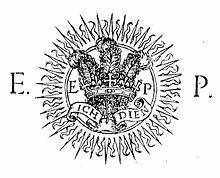 It was also widely used by Prince Edward, son of Henry VIII and afterwards Edward VI, although he was never formally invested as Prince of Wales. Feathers continued to be used as lesser royal badges, by Elizabeth I among others, until the end of the century. Only from the beginning of the 17th century did the badge become exclusively associated with the Prince of Wales. It is has been a part of the coat of arms of the Prince of Wales since at least 1901. According to a longstanding legend, the Black Prince obtained the badge from the blind King John of Bohemia, against whom he fought at the Battle of Crécy in 1346. After the battle, the prince is said to have gone to the body of the dead king, and taken his helmet with its ostrich feather crest, afterwards incorporating the feathers into his arms, and adopting King John's motto, "Ich dien", as his own. The story first appears in writing in 1376, the year of the Black Prince's death. There is, however, no sound historical basis for it, and no evidence for King John having used either the crest (he actually bore a crest of vultures' wings) or the motto. Since a key factor in the English army's victory at Crécy was the use of Welsh archers, it is also sometimes said to have been Edward's pride in the men of Wales which led him to adopt a symbol alluding to their assistance. The mediaeval German motto "Ich dien" ("I serve") is a near-homophone for the Welsh phrase "Eich Dyn" meaning "Your Man", which might have helped endear the young Black Prince to the Welsh soldiers in particular. Again, however, there is no historical evidence to support this theory. In 1917, during the First World War, it was rumoured that the motto might be formally changed to "Eich Dyn" to avoid the use of German. The badge is the cap badge of the Royal Welsh, an amalgamation of three Welsh regiments, the Royal Welch Fusiliers, the Royal Regiment of Wales and the Territorial Army's Royal Welsh Regiment. Previously it was the cap badge of the Prince of Wales's Own Civil Service Rifles, whose motto was also Ich dien. The feathers have traditionally been worn on the jerseys of players in the Welsh rugby union team, being sewn on jerseys of players representing Welsh clubs before a national team or union existed. It has since been adopted as the logo of the Welsh Rugby Union (WRU). In the 1990s, the WRU modified the form of the badge they used to copyright the design. The new logo is more stylised, with "WRU" in place of "Ich dien". As the logo of the WRU, the Prince of Wales' feathers are also represented in one of the quarters of the British and Irish Lions' badge. The Welsh Rugby League has stuck to the traditional three feathers with "Cymru RL" ("RL" standing for "rugby league") written underneath. Surrey County Cricket Club were granted permission in 1915 to use the feathers for their badge. Their home ground, The Oval, is on land owned by the Prince of Wales. The feathers appear on the badge of Wrexham Association Football Club. The feathers are used as the logo of Oxford University Rifle Club (OURC). The Carlton Club uses the feathered coronet badge as its emblem, without the motto. Prince of Wales' College, Moratuwa, Sri Lanka, has used the feathers since the inception of the school in 1876. The badge appeared on the reverse of the British two pence coins minted between 1971 and 2008, many of which remain in circulation. The badge appears as a provenance mark on those silver coins minted using Welsh mined silver in the seventeenth and eighteenth centuries. During the English Civil War, most coins minted by Charles I at his various provincial wartime mints carry the feathers. The feathers appear on these coins because Charles I had no access to the Royal Mint in London and instead transferred the Aberystwyth Mint (originally established to coin Welsh silver) to Shrewsbury and then Oxford as an emergency measure. All the Civil War provincial mints are therefore in effect sub-branches of the Aberystwyth mint. The badge was until 1985 on the coat of arms of Penang, a state in present-day Malaysia, which was founded in 1786 as the settlement of Prince of Wales Island. The badge is inscribed on the foundation stone, laid on 25 February 1927, of Patna Medical College and Hospital, in Patna, Bihar, India, established in 1925 as the Prince of Wales Medical College. The motto "Ich dien" is still widely used within the institution. The badge is used by a society in Malta called 'The Prince of Wales Philharmonic Society'. The scope of this organisation is mainly one related to music but is also linked to the feast of St. Dominic in Vittoriosa in Malta. Malta was a colony of the British Crown for 200 years, and there exist a variety of clubs and organisations bearing the name of royal personalities. From 1932 until its abolition in 1965, the Municipal Borough of Barnes in London used feathers based on those of the Prince of Wales on its coat of arms, in honour of the fact that the then Prince of Wales (afterwards Edward VIII, and later Duke of Windsor) had been born in the borough. Norfolk County Council was given special consent by King Edward VII to use the badge on its arms, in recognition of Sandringham House, which was one of the King's favourite residences. Edward held the title Prince of Wales for 59 years, making him the longest-serving holder. A derivative of the badge is that used by the Prince's Trust, a charitable organisation that helps young people. Many pubs in the UK are named The Prince of Wales's Feathers, the Prince's Feathers or simply the Feathers, particularly in areas associated with royal estates. ^ "National Emblems". Wales.com. Welsh Assembly Government. 2008. Archived from the original on 26 April 2009. Retrieved 1 December 2010. ^ Scott Giles 1929, pp. 89–91. ^ Siddons 2009, pp. 178–9. ^ a b Scott-Giles 1929, p. 89. ^ a b c d Pinches and Pinches 1974, p. 59. ^ a b c Siddons 2009, p. 178. ^ "6th letter". London: telegraph.co.uk. 30 August 2006. ^ Siddons 2009, p. 181. ^ Harris, Oliver D. (2010). ""Une tresriche sepulture": the tomb and chantry of John of Gaunt and Blanche of Lancaster in Old St Paul's Cathedral, London". Church Monuments. 25: 7–35 (22–3). ^ Scott-Giles 1929, pp. 90–91. ^ Siddons 2009, pp. 179–80. ^ Siddons 2009, pp. 182–6. ^ Pinches and Pinches 1974, pp. 89–93. ^ Siddons 2009, pp. 186–8. ^ Siddons 2009, pp. 188–9. ^ Siddons 2009, pp. 187–9. ^ "Motto of Prince of Wales". Aberdeen Weekly Journal. 14 September 1917. p. 3. ^ Williamson, Martin. "A brief history of Surrey". ESPNcricinfo. Retrieved 16 July 2015. ^ "Municipal Borough of Barnes". Heraldry of the World. Retrieved 11 November 2014. ^ "Norfolk County Council". 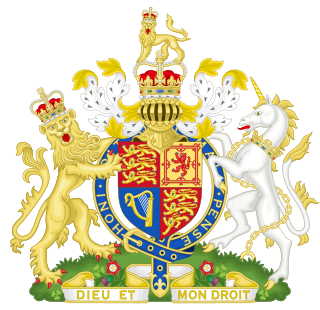 Civic Heraldry of England and Wales. Retrieved 9 December 2014. Pinches, J.H. ; Pinches, R.V. (1974). The Royal Heraldry of England. London: Heraldry Today. ISBN 090045525X. Scott-Giles, C. Wilfrid (1929). The Romance of Heraldry. London: J.M. Dent. Siddons, Michael Powell (2009). Heraldic Badges in England and Wales. 2.1. Woodbridge: Society of Antiquaries/Boydell. pp. 178–90. ISBN 9781843834939. Nemo me impune lacessit was the Latin motto of the Royal Stuart dynasty of Scotland from at least the reign of James VI when it appeared on the reverse side of merk coins minted in 1578 and 1580. It is the adopted motto of the Order of the Thistle and of three Scottish regiments of the British Army. The motto also appears, in conjunction with the collar of the Order of the Thistle, in later versions of the Royal coat of arms of the Kingdom of Scotland and subsequently in the version of the Royal coat of arms of the United Kingdom used in Scotland. It means No one "cuts" (attacks/assails) me with impunity, and has been loosely rendered in Scots as Wha daur meddle wi' me?. It is also alternatively translated into English as No one can harm me unpunished. The Tudor rose is the traditional floral heraldic emblem of England and takes its name and origins from the House of Tudor, which united the House of York and House of Lancaster. 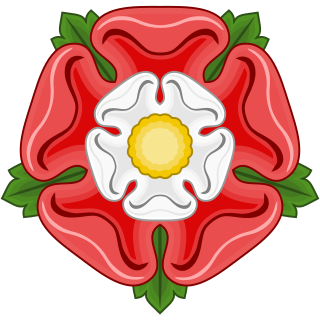 The Tudor rose consists of five white inner petals, representing the House of York, and five red outer petals to represent the House of Lancaster and its superioirty to the House of York. The Welsh Dragon appears on the national flag of Wales. The oldest recorded use of the dragon to symbolise Wales is in the Historia Brittonum, written around AD 829, but it is popularly supposed to have been the battle standard of King Arthur and other ancient Celtic leaders. Its association with these leaders along with other evidence from archaeology, literature, and documentary history led many to suppose that it evolved from an earlier Romano-British national symbol. During the reigns of the Tudor monarchs, the red dragon was used as a supporter in the English Crown's coat of arms. The red dragon is often seen as symbolising all things Welsh, and is used by many public and private institutions. These include the Welsh Government, Visit Wales, the dragon's tongue is in use with the Welsh Language Society and numerous local authorities including Blaenau Gwent, Cardiff, Carmarthenshire, Rhondda Cynon Taf, Swansea, and sports bodies, including the Sport Wales National Centre, the Football Association of Wales, Wrexham A.F.C., Newport Gwent Dragons, and London Welsh RFC. The Welsh Dragon is also one of The Queen's Beasts. 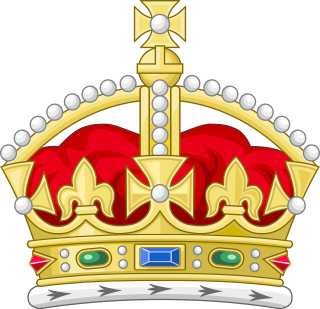 A crown is often an emblem of a sovereign state, usually a monarchy, but also used by some republics. Heraldry in Wales has a tradition distinct from that of English and Scottish heraldry. There is evidence that heraldry was already being used in Wales by the middle of the thirteenth century; for instance, in Gwynedd, two sons of Llywelyn the Great are recorded as having borne coats of arms in this period. Following the integration of Wales into England in the fourteenth and fifteenth centuries, the Welsh heraldic tradition became merged into that of England. A Scottish crest badge is a heraldic badge worn to show allegiance to an individual or membership in a specific Scottish clan. Crest badges are commonly called clan crests, but this is a misnomer; there is no such thing as a collective clan crest, just as there is no such thing as a clan coat of arms. The civic coat of arms of Penang is largely based on the coat of arms of Penang first granted to the Settlement of Penang, then in the Federation of Malaya, by a Royal Warrant of King George VI dated 11 September 1949.